Click to listen to episode (2:30). From the Cumberland Gap to the Atlantic Ocean, this is Virginia Water Radio for the week of April 15, 2013. This week we feature another series of mystery sounds. Have a listen for about 20 seconds, and see if you can guess what’s making these three different high-pitched songs. And here’s a hint: These small creatures make big journeys, twice a year. SOUND.If you guessed warblers, you’re right. 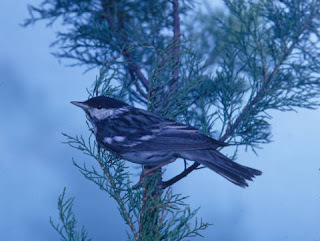 And if you’re an experienced birder, you may have recognized the songs of a Bay-breasted Warbler, Blackpoll Warbler, and Tennessee Warbler. These species, which breed primarily in Canada or the northern United States, but winter in Central and South America, are among the birds that may pass through Virginia during spring or fall migration. Virginia’s location along the Atlantic coast and Chesapeake Bay allows Commonwealth birders to have a chance to see songbirds, waterfowl, and birds of prey that migrate along the broad, eastern North American route known as the Atlantic Flyway, one of four main routes on this continent. For example, about 100 bird species breed in the Great Dismal Swamp National Wildlife Refuge in southeastern Virginia, but over 200 species have been identified there, particularly during the spring migration from April to June. If you’d like to see some of these birds on the move, the Great Dismal Swamp Birding Festival takes place this year from April 25-27. Thanks to Lang Elliott for permission to use this week’s sounds. Blackpoll Warbler. Photo from U.S. Fish and Wildlife Service National Digital Library, http://digitalmedia.fws.gov/cdm/, accessed 4/15/13. The sounds of the Bay-breasted Warbler, Blackpoll, and Tennessee Warbler were taken from the Stokes Field Guide to Bird Songs-Eastern Region CD set, by Lang Elliott with Donald and Lillian Stokes (Time Warner Audio Books, copyright 1997), used with permission of Lang Elliott, whose work is available online at http://www.langelliott.com/ and the “Music of Nature” Web site, http://www.musicofnature.org/. The sound of the Bay-breasted Warbler and information on bird migration was previously included in Virginia Water Radio Episode 66 (week of 5-16-11; audio now archived). Information on migratory flyways in North America was taken from the “Migratory Birds” Web site of the U.S. Fish and Wildlife Services (FWS) Chesapeake Bay Field Office, at http://www.fws.gov/chesapeakebay/migbird.html; and from the “Migratory Bird Flyways” Web site of the FWS’ Migratory Bird Program, online at http://www.fws.gov/migratorybirds/Flyways.html. Information on distribution and habitats of Bay-breasted Warbler, Blackpoll Warbler, and Tennessee Warbler was taken from A Guide to Field Identification of Birds of North America, by Chandler S. Robbins et al. (New York: St. Martin’s Press, 2001); and the “Birds of North America Online” Web site from the Cornell University Lab of Ornithology and American Ornithologists’ Union, online at http://bna.birds.cornell.edu/bna (subscription required for this Web site). Information on birds in Great Dismal Swamp National Wildlife Refuge is available from the U.S. Fish and Wildlife Service’s bird checklist for the Refuge, online at http://www.npwrc.usgs.gov/resource/birds/chekbird/r5/dismal.htm, and from the Refuge Web site at http://www.fws.gov/refuge/great_dismal_swamp/. Information on migration dates for birds in Virginia and other states is available from the “Nutty Birdwatcher” Web site at http://www.birdnature.com/timetable.html. The 2013 Great Dismal Swamp Birding Festival will be held April 25-27. Information is available online at http://www.visitchesapeake.com/gds-birding-festival/ or from Deloras Freeman (U.S. FWS) at (757) 986-3705.
International Migratory Bird Day is held each year on the second Saturday in May; the event’s Web site is http://www.birdday.org/birdday. For an account of one particularly water-based warbler, see "Yellow warbler's song means mellow days of spring can't be too far behind," by Mike Burke in the April 2013 issue of Bay Journal. This species, found in summer in Virginia and other Bay states, prefers habitat in willow trees and other thick vegetation around streams, ponds, and other aquatic areas. *Virginia Society of Ornithology at www.virginiabirds.net. *Cornell University Lab of Ornithology’s “All About Birds” Web site at http://www.allaboutbirds.org. The site includes photos, distribution maps, recordings of calls, and ecological information on birds throughout the Western Hemisphere; a subscription is required to use the “Birds of North America Online” site.